HONOLULU (CNS) — In addition to offering prayers, the Catholic Church is stepping into action on behalf of hundreds of residents displaced from a fierce and unpredictable volcanic eruption. Members of Sacred Heart Parish in the town of Pahoa in the Puna District of the island of Hawaii — known colloquially as the Big Island — are opening their hearts, their homes and their parish hall to those forced to flee the lava flowing from cracks in the ground in their neighborhood. Bishop Larry Silva of Honolulu has visited and offered his assistance. Local Catholic service agencies are working with victims, coordinating aid efforts, and collecting and distributing funds. 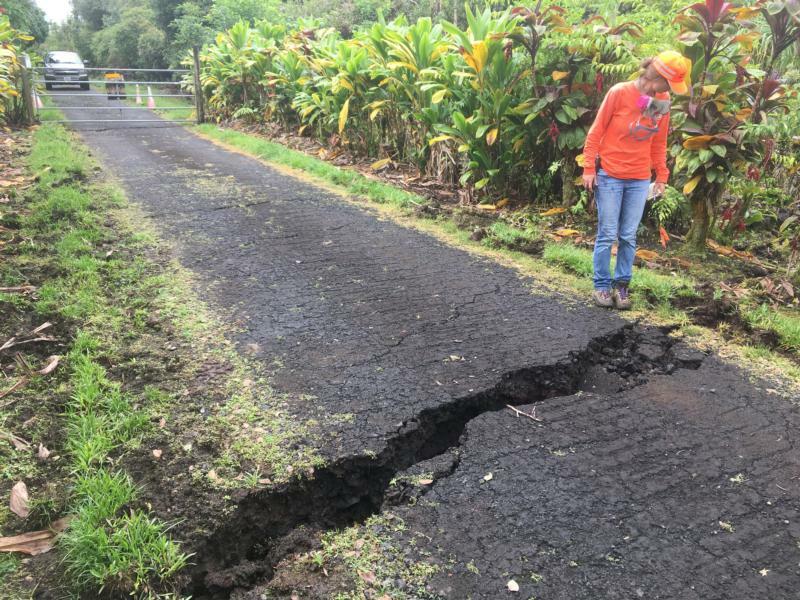 About 1,700 people reside in Leilani Estates, a rural subdivision of acre-sized lots on a grid of about 22 miles of roads, where at least 15 fissures have opened up since May 3 spewing molten rock and poisonous sulfur dioxide gas. A Hawaii County evacuation order sent subdivision residents packing shortly after the eruption began. According to Hawaii County Civil Defense, 36 structures, including 26 homes, already have been destroyed by lava from the 2.5-mile-long fissure system, the newest outflow from Kilauea Volcano, which has been erupting since 1983. Lava so far has covered more than 115 acres. During pauses in the volcanic activity, residents have been allowed to return to their homes to retrieve belongings. Some are staying at two county evacuation centers. Sacred Heart parishioners are being taken in by fellow parish members, according to parish administrator Father Ernesto Juarez. “Parishioners are opening up their homes,” he told the Hawaii Catholic Herald, Honolulu’s diocesan newspaper. Bishop Silva was at the parish May 5-6, the weekend the eruption started, for a previously arranged episcopal visitation and to administer the sacrament of confirmation. With hundreds of small earthquakes predicting volcanic activity, the bishop had offered to reschedule his visit, but Father Juarez, after consulting with some of his parishioners, decided to proceed as planned. “I was happy to be there with them during that time,” the bishop said. He said he could see from the church the plume of smoke from the eruption site. “I asked them to keep me informed to see if there was anything I could do or if there were any services of the diocese that needed to be mobilized,” he said. “We will continue to monitor the situation and will let people in the diocese know if there are any specific ways they can help,” he said. Father Juarez volunteered the parish hall as a crisis information center. At the center, which is open weekday, evacuees from the Leilani Estates and the smaller Lanipuna Gardens subdivision connect with personnel from Hawaii County and social service agencies for information or to apply for assistance. Participating organizations include Child and Family Services, The Food Basket, Catholic Charities Hawaii and HOPE Services Hawaii. HOPE Services Hawaii, which deals primarily with homelessness on the Big Island, has deployed several staff members who, with others, are collecting data on evacuated households to determine their needs. As of May 10, the agency had gathered information on nearly 300 households. Other families have temporarily settled in with family and friends, but will have needs down the road, she said. Some hope to eventually go back home. “We’re still only days in and it looks like this is going to be a long one,” Menino said. She added some of the agencies involved cover financial assistance, food, shelter, counseling, case management, physical and mental health, clothing, legal assistance and animal care. HOPE Services has already given out some rent assistance. In a message to Big Island parishes, Catholic Charities Hawaii’s Hawaii Island Community Director Elizabeth Murph said housing needs are a looming concern, in particular for those with mortgages to pay on houses they no longer have access to. She said besides stable housing, other immediate needs include counseling, clothing, and gift cards for groceries, household items and gas. Catholic Charities Hawaii has asked the public for monetary donations to be used for direct housing assistance for the victims of both the Kilauea eruption and April’s historic flooding on Kauai. Donations will go toward temporary housing subsidies, emergency home repairs and other related needs. “Funds will be immediately available” to victims, Murph said, compared to money from other organizations distributed through a lengthy grant process. Father Juarez, who has been at the parish for less than a year, visited the main evacuation shelter in Pahoa May 7. Several hundred people are being temporarily housed there. He was joined by former pastor Jesuit Father Mike Scully, parish religious education director Maila Naiga and parishioners Liz Morgan and Roberta Vangoethem. “We talked to them, shared stories, offering comfort, letting them know that there are people who have great concern about their plight,” Father Juarez said. The parish is bringing back into action its Disaster Assistance Relief Team, which was mobilized when Tropical Storm Iselle ravaged the east side of the Big Island in 2014, and later that same year when a lava flow threatened Pahoa. At an East Hawaii vicariate meeting May 8, Father Juarez said, some of his fellow Big Island priests offered their parishes for “refuge.” At the meeting the priest gathered rosaries, Bibles and holy water to be distributed at the evacuation center. Father Juarez said his church, which is three-and-a-half miles from the eruption, is not in any immediate danger. “We are safe in Pahoa as of now but we are always reminded to be vigilant,” he said.